I want to share with you the latest book project from the Near Future Laboratory. It’s called TBD Catalog — the Design Fiction product catalog for the normal ordinary everyday near future. 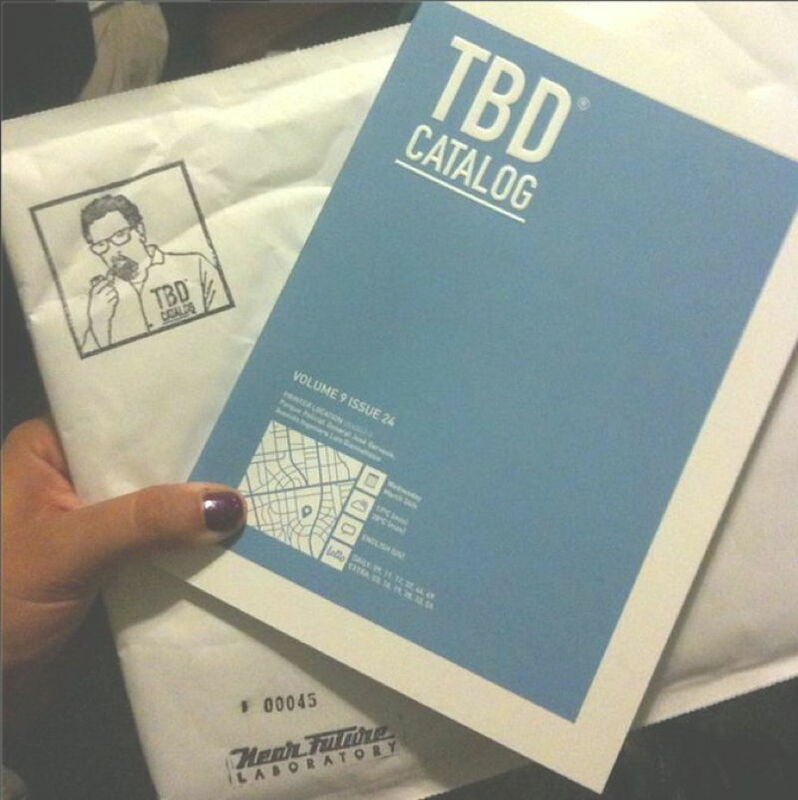 You can get your own copy of TBD Catalog here in our own shop. We’re also a publisher now, in the modern sense. TBD Catalog contains 166 products, 62 classifieds and advertisements to tell little stories about the world we are likely to inhabit if the exuberant venture capitalist handlers and computer programming day laborers of Silicon Valley have their way. It’s a future quite different from the perfect, seamless, integrated, one-touch, Cloud-based advertising fakery used to make your pupils dilate with “wantfulness” — a want for cute connected family robots, software and plastic dongles ‘made with love’ and self-driving cars with impish earnest eager bumper faces and $9 drip coffee made with algorithmic precision and ordered ahead from an App. The future represented in TBD Catalog starts with Silicon Valley’s breathless visions — and plops it down on the counter of your corner bodega. This is the future that comes in party colors. It’s the 3/$1.00 and buy one get one free future. Got your iPhone stolen? 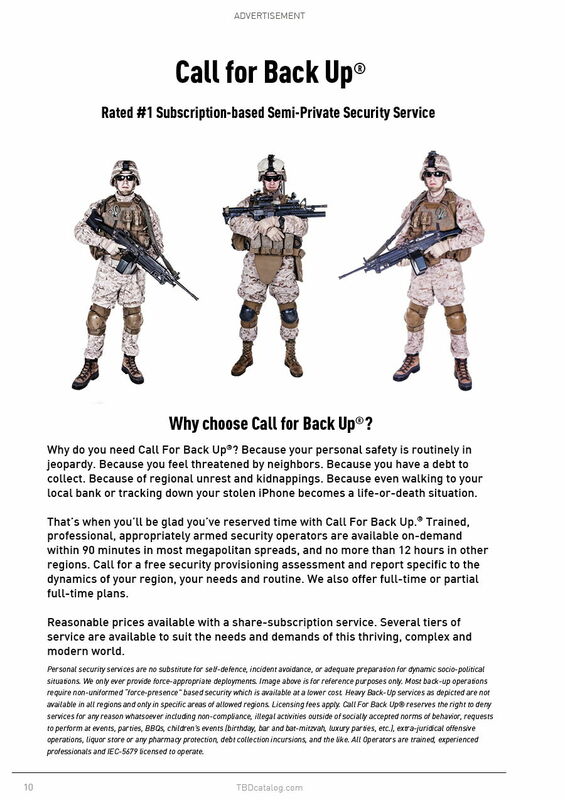 In the TBD future, if you’ve got ‘Find My Phone’ enabled, just use your Call For Backup App — we’ll send some licensed and disciplined toughs fresh back from Spec-Ops to knock on doors, fold their arms and growl imposingly if necessary. It’s the Uber of semi-private personal security. With TBD Catalog our technique for employing Design Fiction was to follow today’s major “tech” trends and see where their hyperbole might likely wind up in some likely normal ordinary everyday near future — 3D Printers; Internet of Things; the Algorithmic Life; The Cloud; Machine Intelligence; New Funding Models; Mass Customization; Etcetera. The TBD Catalog future is the near future ordinary. The constant low power and exploding battery future. The bad firmware bricked $800 device future. The lousy customer service phone menu UX and busted algorithms that send a hundred emails to the same customer and shift-reload doesn’t clear the error future. The bad monopoly network service conglomerate run like an accounting firm future. That world. The one when ‘now’ becomes ‘then’ — after all the glitzy wearables/internet-of-things/self-driving car Kickstarter advertising TechCrunch blogger promises dull to their likely normal. We did TBD Catalog because no one else has done so much to tell a story about the likely future beyond excruciating, mind-numbing white papers, link-bait blog posts and breathless “insights” from strategy agency reports that read as though they’re in league with the pundits who all basically work for the startups anyway. We wanted a perspective that was engaging, entertaining and probable while also insightful, generative and provocative. Take a look around amongst the strata of futurists, insights reports, strategy assessments, TED Talks and the like. There is little to go on to ruminate about these trends beyond the vague “imagine a world..” fantasy scenarios and dreamy video pitches with earnest mandolin soundtracks. There are scant stories about a world when these trend-things are fully-vested within our lives in a way that doesn’t seem like the boom-cycle perfect world advertisement where we 3D print fresh licensed Opiline knife sets. The stories we get are either perfect utopia futures or the robot-zombie apocalyptic busted future with fascist jetpack cops chasing down malcontents. TBD Catalog cuts through the middle to tell stories from a world where Nobel Prize winning technology is sitting on the counter of your corner liquor store in 23 different colors, all with a keychain and instructions on how to entertain your cat. This “ordinary” story is the one we’re working towards. These are the stories that are in short supply. Stories about our world when the extraordinary idea makes its inevitable journey to become the ordinary commodity thing that occasionally needs repair or a software patch for a security flaw. TBD Catalog creates these sorts of stories by hinting at the implications of today’s ‘disruptions’ — by representing the kinds of products and services we might imagine in the near future and implying little corners of that near future world and the social lives around it. 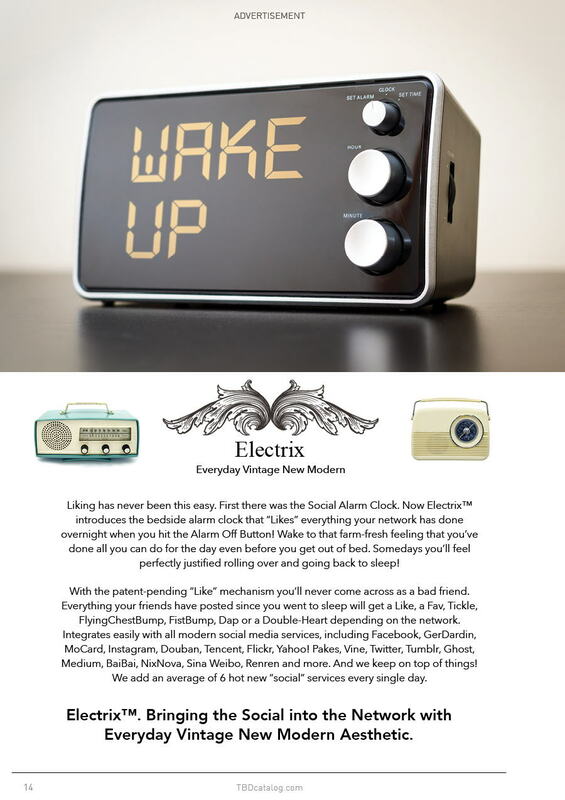 In TBD Catalog each product, service, classified advertisement and customer review is a bit of Design Fiction — a mix of trending topic plus designed object plus a small evocative story-description. Each Design Fiction is a little story about life in our likely near future world. What are some of the stories in TBD Catalog? 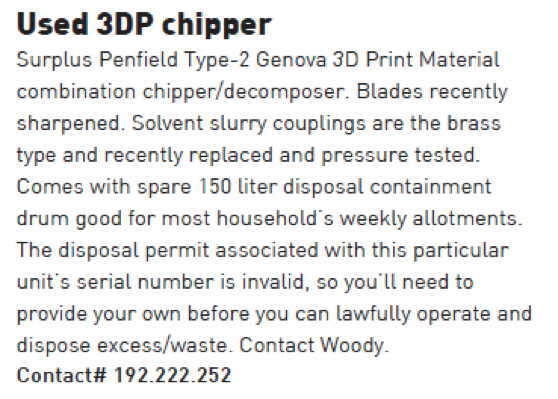 TBD Catalog tells a story about a world in which every household has as many 3D printers as they now have electric toothbrushes, and a lease-licensed 3D printer material waste disposal unit. 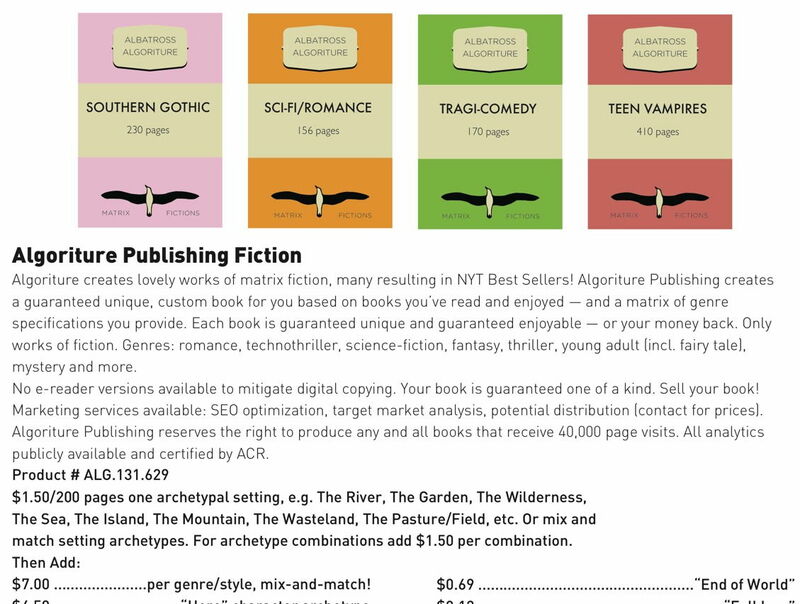 TBD Catalog reveals a world with bland “Algoriture” algorithmic literature optimized for trends, tastes and expectations and written by Amazon’s data analytic-fed intelligent bots rather than normal, human authors. What about a world in which algorithms are so trusted, we allow them to find a playmate for our children, or the perfect “soul mate” for ourselves when we turn 18. 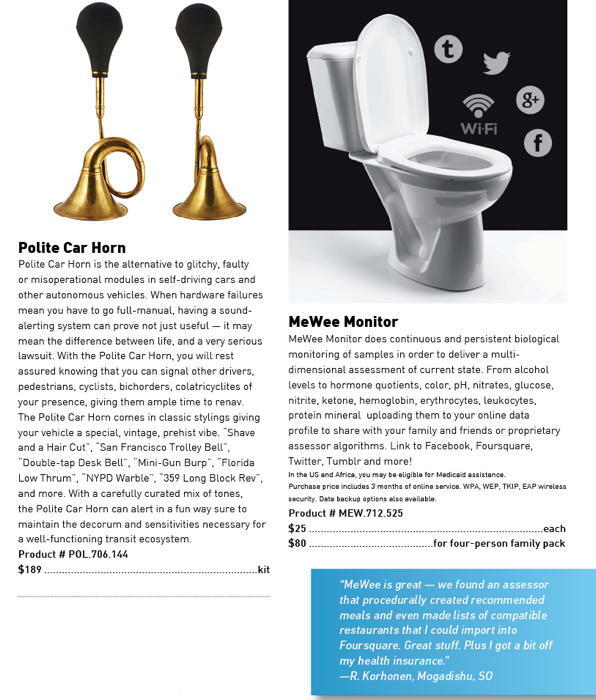 MeWee Monitor hints at what an Internet of Things world might look like if everything — the glass you drink with, the bar stool you sit on, and the bathroom door you lock behind you and the chamber pot you sit upon — is connected to everything else, and lets the world know what it’s doing. Why did we do a product catalog from a likely future? The Near Future Laboratory is of the opinion that whatever “comes next” should be prototyped not just in hardware and software (which we do, and enjoy) but through compelling, engaging, tangible moments that play out near future scenarios. Not only the spot-on-perfect advertiser-scripted scenarios, but the more likely and realistic moments as well. This sort of prototyping has imminent value as a means of shaping an idea, reflecting on contingencies, making things better and feel more full-vested in the world. Design Fiction is a form of prototyping an idea. It’s a way of reflection that can take an idea, trend or concept and intimate it in a more material form that can generate conversations that then reshape the idea into something better. Design Fictions have a remarkable ability to make that materialized concept come to life in a much more embodied way than specifications, one-pager or items in a PowerPoint bullet list. TBD Catalog’s Design Fictions take the promise of extraordinary and weird Silicon Valley aspirations and turn them into the normal and ordinary props that come to life as part of our everyday lives. Design Fictions have exceptional value from a pragmatic perspective. They are more than entertainment. Design Fiction can operate as a viable approach to design itself — a form of exercising hunches without committing to full-blown execution. Design Fiction can find the tangential implications and alternative possibilities of your instincts — and then show a path forward towards sketching, testing and materializing your ideas. 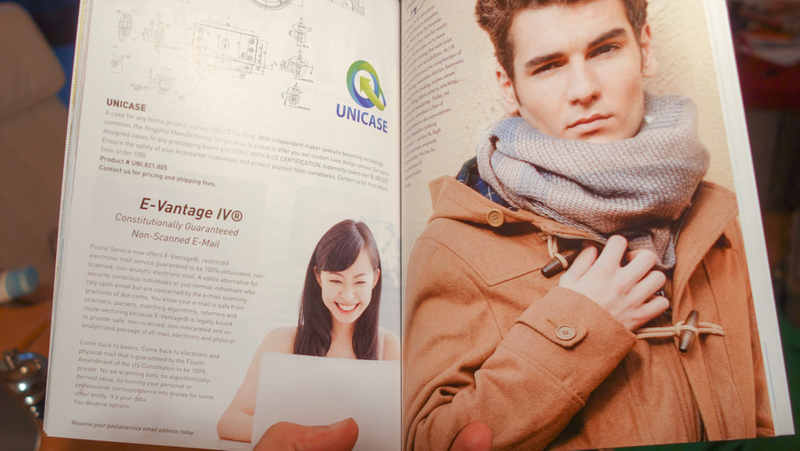 As a catalog in which your idea might exist in the future. As a fictionalized quick start guide. As an instruction manual or bug report. As a blogger’s review or customer service script. Design Fiction is a creative instrument. It is truly a form of prototyping. It is an approach to design and strategic foresight that is actually generative. Design Fictions provide the basis for viable ideas, even in the idiom of satire. In their second reads, they become more — each of the 166 products has a “..huh” moment. There are dozens and dozens of Kickstarters in here, surely. And a few things in TBD Catalog we here at the Near Future Laboratory have actually prototyped — for real. Even some we’re pursuing after having our own “..huh..that could work..” revelation. Let me be clear — we here are not opposed to the “next new thing.” We are eager to entertain. But also — we focus on creating ‘next new things’ everyday. TBD Catalog is meant to remind us that every cool trend, every ‘wow’ gadget, and even some Nobel Prize-winning technologies become entertainment devices for our house cats or a faster way to stream crappy online ads. We need those kinds of likely near future representations — as alternative as they are to the glowing reports in your favorite trends blog — to focus ourselves on the challenges this world faces in light of rapidly changing behaviors, expectations, desires, rituals and algorithms. Welcome to your near future normal ordinary everyday. Last October we gathered for a Laboratory day retreat and decided — so long as we’re all together — why don’t we make a thing of it. So, we arranged to do an evening’s gathering with our friends at IDEO. Scott Paterson from IDEO facilitated our way into IDEO’s splendid waterfront facility. We brought beer, IDEO brought beer, we had lots of beer and, most importantly, we shared with our audience some perspectives on Design Fiction. Our friend Ed Finn from Arizona State University’s Center for Science and the Imagination helped us set the metaphorical table. Sharing thoughts were Julian Bleecker, James Bridle, Nick Foster and Cliff Kuang from Wired facilitated the conversation. It was “delightful”, as the kids are fond of saying nowadays. But, more delightful than the most delightful UX. Properly delightful in the way that a gathering of humans in a room can be delightful. A gathering to think, debate, discuss and laugh. Like a salon. We will be hosting more of these around the globe, as our Bureau of Delightful Design Fiction Evening Events spins-up and makes it Napoleonic plans. We are the Near Future Laboratory. Welcome to us. On Thursday October 24th we would like to meet up with you to talk about design. And fiction. And the ways of approaching the challenge of all challenges, whatever it may be. We’ll talk about expressing the opportunities those challenges raise as distinctly new tangible forms. As well as the essential value of mundane design. We’ll talk about clarifying the present. We’ll talk about designing the future. And doing both of these things with design. And fiction. Come and enjoy. We’ll be us, and we’ll also be James Bridle, a friend of ours. There will be two and a half free regional beers for everyone. Space is limited because we’re in a room. Sign up on Eventbrite, or you may become deflated. WE'RE SERIOUS: EVEN THOUGH THIS IS A FREE EVENT, YOU MUST BE TICKETED TO ENTER. PLEASE DON'T SHOW UP WITHOUT A TICKET AS WE PROBABLY WON'T BE ABLE TO LET YOU IN. For those of you who haven’t subscribed, or don’t know about it, Green Pages is Design Fiction operationalized. Green Pages makes Design Fiction into something the entertainment industry can use directly. In Part 1 of each issue we curate a careful selection of imminent and emerging technologies, provide a brief on each. In Part 2 we select a number of these and provide authored narrative and cinematic elements that are one-page diegetic prototypes, elements of fictions, Macguffins, props, prototypes, conceits, etc. An example of Part 2 would be a one page plot synopsis, or a bit of production design for a prop informed by one of the technologies introduced in the issue. The stories in Part 2 for this issue are especially good. They do not make the technical element central, but rather use it as stimulus for a proper narrative. We spent a lot of time unearthing good, dramatic, character-driven stuff that wasn’t ham-fisted techno-thriller fodder. I’m excited by these stories — they’re quite compelling, evocative moments of larger dramas that could easily see their way to being produced in some form — film, pilot, novel, etc. Since this is the first time we’ve mentioned Green Pages here on the blog, I should say that it is a trade publication — it’s not an art project, or flight of design fancy. It’s an edited journal for a specific trade audience — producers, agents, writers, production designers, directors, etc. It’s not a PDF — we print it, authenticate each copy of each issue, and mail them out like normal, human print publications. There has been interest beyond Hollywood for a publication like this. That’s partially because of the content but also some interest in the approach we take to translating raw technology ideas into compelling narratives — scenarios, they’re called in other domains. For the workshop here at Emerge 2013, we thought the general approach to creating these Design Fictions and diegetic prototypes would be a worthwhile learning experience for folks at a large research university like ASU. For example, engineers and scientists who perhaps could learn how to translate technical stuff into compelling stories that help them round out the purely technical idea (wireless power distribution, for example) with issues and implications in a broader sense. Working in a room with engineers, policy gurus, creative writers all at once — everyone with their game-face on — was truly exciting and extremely productive. We had some excellent, exciting starters .We managed to get a solid bit of work on them the first day. Then on the second day we had some super exciting creative work — a screenplay excerpt, page one of a novel, a film synopsis, character casting notes and production design for a key prop of eco-thriller. We’ll be working over the next weeks to clean up the material — in one and a half days it’s difficult to really complete a full issue, printing and binding and all that. But we were able to get the core done and hand out a few to the Emerge participants. Welcome to Issue 7 of Green Pages. This is a milestone issue for a number of reasons. Firstly, our subscriptions have more than doubled since we first launched — and that happened entirely by word of mouth. This kind of growth is unprecedented in the trade journal world. We’ve also received an unprecedented number of recommendations from you, our subscribers, recommending colleagues for a complimentary issue. Thank you for the suggestions. We are working hard to follow through and vet your nominations. We’re also excited because this issue was done in collaboration with the Arizona State University’s Center for Science and the Imagination. This is the first time we’ve worked directly with a major research university. We hope this will set a new precedent for the way we create and curate our content. Inside this issue you’ll find a diverse collection of our front pages containing concepts that range from biotech to counter-surveillance to prosthetic enhancements. There’s Swarm Robotics, Encoded Ballistics, Image-based Diagnostics, Foliage Penetrating Radar, Lab Grown Bone, Afterlife Cells, Surveillance Drone Mitigation, Depression Detection Systems, Lighter Than Air Vehicles, Billion Pixel Camera, Digitigrade Prostheses, Tracheal Scrubbers, Data Magnets, Predictive Vaccines, Nanoturbine Surfaces, Organ Printing, ‘Miracle Salt’, Svalbard Gene & Seed Bank, Vortex Ring Gun, and more. There are some very exciting, provocative research projects that are easily extended into the realm of story telling — and not all as purely techno-thrillers. We’ve developed several of these into one pages conceits and précis both cinematic and traditional narrative-based. We have some evocative production design as well. Overall, we’re quite happy with this issue. We hope you enjoy it. Amongst the projects we publicly declare here on the Laboratory blog, there are probably x2 others that we don’t. We plan to change that ratio henceforth. These are our “non-battery” powered projects. By that I mean that they are not traditional technocultural things — those things that have come to define the laboratory, from Flavonoid engineered prototypes to industrially fortified data vizualization software to game controllers for pets to studies in curious interaction rituals. But, they are projects and they reflect the more complete aspects of the Laboratory as a practice. They are a reflection of our additional interests, curiosities and explorations. Some of them are exercises of a more proto-professional nature, to explore ways of studying the world around us, short probes into a field of practice about which we want to understand by doing rather than by idle observation. In sum, they represent ways that the Laboratory is always curious, always learning, never set or fixed in what it does and how it does it. This makes me understand the Laboratory as a practice. A bit like a studio. But, I understand now even more as we grow and as more people join in, that it is better to communicate the multivalent character of the Laboratory through more aspects of what we here do. There are no “side projects” in this practice. There are we all who are always following our curiosities. As the name of our Laboratory implies, we’re very interested in the hands-on, pragmatic ways in which one can imagine and then create things from and for the near future. In that sense, we design products and the like. Stuff. We make stuff. They are just things from and for the near future. Which shouldn’t be a problem. They just need to be designed with care and a sensitivity to what futures we expect or would like. Then the opportunities for that stuff is revealed. Over the years we’ve developed an approach and a sensibility for thinking about the near future. It’s an approach that is object-based in that we make things — call them products, sometimes software, sometimes other kinds of wares. It’s a sensibility that is infused with the quotidian and everyday almost to the point of the mundane, because ultimately everything trends towards that and things seem more real and “read” easier when they simply exist without fanfare and hype. And always our approach is provocative, as in provoking conversations and stories and drama about the near future. A few months ago, I asked a small group of friends to meet me and my Laboratory cohort in Detroit at the beginning of October. I wanted time together with friends whose work shares something with the Laboratory’s way of making and thinking. I wanted time to be less yammer-y and more hammer-y. The goal was to participate in a three day workshop. We were to make something and Detroit seemed like an apropos place to make a future thing that is more everyday than the future imagined in Palo Alto. Plus, it’s about midway between Los Angeles and London, more or less and I wanted to make it easy for friends from other parts to come, on their own dime, and do some work. The work of the workshop was to make a Design Fiction product catalog using all the principles, approaches, tools and work kits that the Laboratory has gathered together over the years. A bit of background, then. When I first looked seriously at how science fiction shapes and informs the way we think about technology, it did not occur to me that one could do science fiction. Rather, one received it as packaged — in a book, a film, comic, a television series, etc. Of course, I’d come to understand differently. When I wrote my dissertation and in subsequent projects, I came to realize that telling stories can happen in many ways besides novels and films. Objects can be evocative of stories — props and prototypes that our imagination begins to fill in with their reason for existing, their operation, their role. In what I see as an addendum to that earlier work, pre-21st century work, I discussed the possibility that there’s a space for design-technology in between science fact and science fiction. The emphasis on technology-informed design is deliberate and its more a reflection of my own engineering background and interests than an attempt to cordon off other significant facets of design. Design-technology makes sense in the idioms of science fact and science fiction so — here it is: Design Fiction is the deliberate and purposeful act of doing fiction through design. It’s telling stories by making things up, with an emphasis on “things” and their making. So, this is what we did. With gracious support from the Penny W. Stamps School of Art and Design we all gathered together for a quite intensive three days of making things up. The brief was simple: make up a product catalog from the near future. Christian came along and helped represent the work of the workshop with some fantastic video documentation which will become part of the documentation output. In the meantime, here’s the teaser. TO BE DESIGNED (teaser) from svanes on Vimeo. That’s it. Very Design Fiction-y. This is the catalog that some creative agency might gin up as a prop to sit on a living room end table and barely get a moment of screen time in some science-fiction film. But, it’d be true to itself, rather than stuffed full of blank pages to make it puff up a bit and look tangible. Someone would take the brief seriously and fill it with things-that-could-be. And so we did that — we made a Design Fiction product catalog. Something from the near future. The product catalog serves as a reification of the needs, wants, desires, ambitions, fears of people as decanted into made products and provided services. And it’s an everyday, tangible thing to which most anyone can relate and comprehend. With a product catalog, there is no need to be explicit, didactic or theoretical about the characteristics of the world at some unspecified moment in the near future. The products in the catalog serve as stand-ins and props that are representative of the everyday drama implicit in their existence. You can imply quite a bit with this form. The product catalog begins an evocative conversation with the everyday of some near future world. Our rough working model was the SkyMall catalog for its outlandish everyday-ness. Skymall is a reminder that the world and its perceived needs, deficits and dreams has an extreme diversity. We had many other catalogs as reference points, too. Everything from the canonically yellow, talmudic McMaster-Carr to Hammacher-Schlemmer to specialty hunting outfitters and archival Sears & Roebuck catalogs. To readers of this blog, desire and need may be defined more by the considered and crafted high-order capitol-D Design products. Our approach was to be different. To be more everyday. To travel a bit further along the hype curve and a bit towards the 99 cents end of the long tail, where normal humans live. For example, we sell a product — “Rejuvenating Ear Fresheners” — that is recommended by 4 out of 5 doctors for those who spend more than 70 hours per week in front of a screen. “Second Nature” re-engineers your food by neutralizing any GMOs with an easy spray application. “Armstrong” (“Pure Blood, Pure Focus”) home blood oxygenation kit relieves you from the burden — and danger — of breathing dust, pollen and toxin-laden air for up to three hours. “Carbon Rain” by Tactical Weather Systems provides extreme weather protection for your fight against big weather and is made of nanofibre ferrule and kevlar skin to protect you from El Nino events, acid rain, high-UV conditions, volcanic ash, &c.
And so on, like this, for 179 products. We had three days and wanted a tangible outcome, so we collectively selected 30 to create a full product description — name, image, price, description, key-selling points and customer endorsements. With these we did a couple of iterations on an actual catalog that we could all gather around and discuss. Subsequently we’ll do the same for some significant portion of the remaining products and then produce and print the catalog, and figure out a good way to distribute it. Megan Mulholland who participated in the workshop did a wonderful write-up of the To Be Designed workshop itself. I could do no better so you may as well read what she wrote. 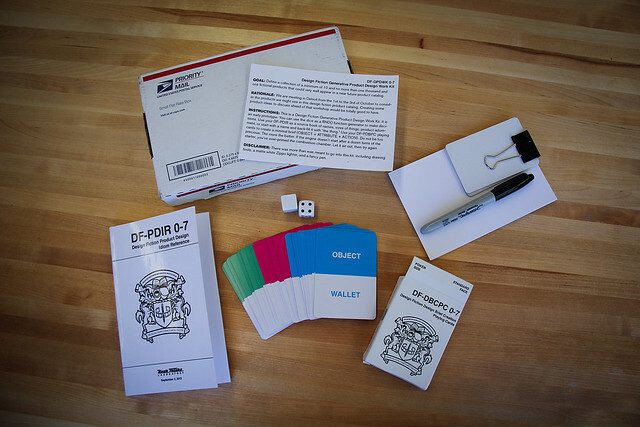 We made a prototype of a Design Fiction Work Kit that was sent out to participants in advance of the workshop. It was quite a good bit of fun to make. It was also meant to be a sort of back-up chute if we got stuck for ideas. That didn’t happen — 179 reasonably suitable product ideas in an afternoon — so we didn’t get to use the kit directly, although I do think it set the tone and mood of the workshop indirectly. I think with a bit of refinement and some additions, the work kit could be a fantastic tool for future TBD events.